And have we some great news for you! This year we’ll organize the one and only Rotterdam Marathon Shake Out Run! On Friday evening April 5th, 19h, we’ll meet at the Marathon Statue, next to the Erasmusbridge. 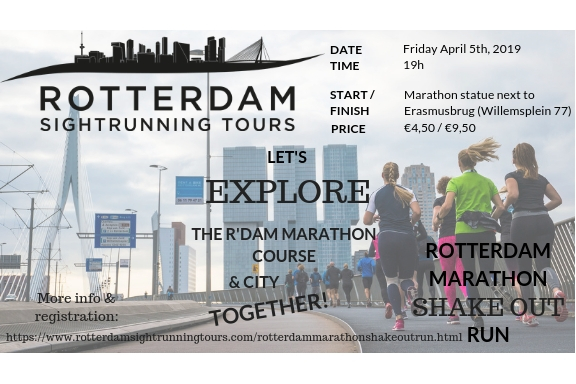 From there we’ll start our (approximately) 5km runningtour, in which you’ll not only get a better knowledge of the marathon- course, but in which you’ll get to know the city of Rotterdam much better as well! It’s also a great opportunity to shake out your legs for the last time before Sunday Raceday. And isn’t that much more fun with other like- minded runners from all over the world? The runningtour- guide of the evening will be multiple (ultra-) marathonrunner Anne Groenewege, co- founder of the Rotterdam Sightrunning Tours. Besides the Rotterdam Marathon (’12, ’13, ’14, ’17, ’18) she ran Reykjavik (’14), Boston and Berlin (’15), Two Oceans (’16), 60 van Texel and 50 van Gieten (’17) and the Comrades (’17, ’18). Anne’s been living in Rotterdam for about 20 years and has seen this city and marathon grow and develop in a positive way and wants to share that with all of you. So register through the link below. With proof of registration for the Rotterdam Marathon’19 or Quarter Marathon ’19, this Sake Out Run will only cost €4,20 per person. Other runners are also welcome ofcourse! For these runners the costs will be €9,50 per person. Please make sure you register quickly as there’s a limited amount of spots available! If you have any questions? Please go to our contact page.